Happy Friday of a very busy week in Washington! And, a belated Happy Women’s History Month! Here are a few things that happened this week worth checking out. Today is World Wildlife Day. A sloth, palm civet, penguin, kangaroo (named George, see above) and binturong were in Rayburn on Wednesday night for an early celebration of the day with a focus on combating wildlife trafficking. The animals came in from the Association of Zoos and Aquariums’ Columbus Zoo. Rep. Ed Royce, R-Calif., who championed the END Wildlife Trafficking Act last year, attended and posed for photos with some cute animals. The event was sponsored by the Wildlife Conservation Society, World Wildlife Fund, International Fund for Animal Welfare, Association of Zoos and Aquariums, Defenders of Wildlife, Environmental Investigation Agency, African Wildlife Foundation and Natural Resources Defense Council. 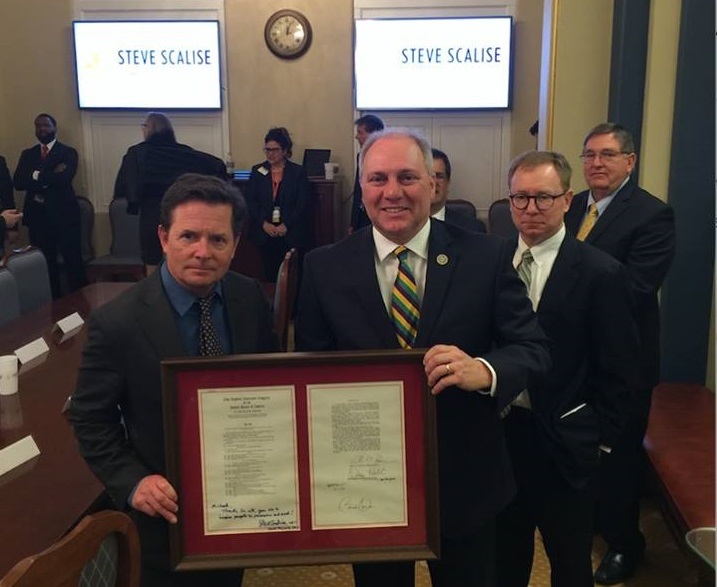 House Majority Whip Steve Scalise, R-La., hosted actor Michael J. Fox in his office this week. Fox was in D.C. for his foundation’s 2017 Parkinson’s Policy Forum on Tuesday, which Scalise, House Minority Leader Nancy Pelosi, D-Calif. and other members attended to discuss federal funding for Parkinson’s disease. At the meeting, Scalise surprised Fox, who has Parkinson’s, with a signed redline copy of the 21st Century Cures Act, which the actor helped advocate. Rep. Martha McSally, R-Ariz., showed off her singing talents recently. She sang the National Anthem at a University of Arizona basketball game last weekend. The grand opening of a new smoothie place, Tropical Smoothie Café in Capitol Heights, is today. On Friday and Saturday, there will be free giveaways, product tastings and special menu deals. The first 50 first-time customers to be in line by 7 a.m. will receive free smoothies for a year. It’s located at at 1703 Ritchie Station Court, Suite 100. “I am tired of reading about innuendo. Somebody is leaking this crap, and it’s putting people like me in a terrible spot. So, I’m going to meet with the FBI director today, and I’m going to look him in the eye and he’s going to tell me there’s an investigation or there’s not. And if he doesn’t tell me, he’s going to have a hard time.”— Sen. Lindsey Graham, R-S.C., prior to his meeting with FBI Director James B. Comey, on whether the FBI is investigating connections between Donald Trump’s presidential campaign and Russian officials. Rep. Paul Cook, R-Calif., 74. Rep. Tom Emmer, R-Minn., 56. Rep. Mike Gallagher, R-Wis., 33. Rep. David Schweikert, R-Ariz., 55. Sen. James Lankford, R-Okla., 49. Rep. Christopher H. Smith, R-N.J., 64.